Last June in this space, we featured a powerful letter to Sen. Thom Tillis from veteran Raleigh business attorney Press Millen about the horrific situation in American immigration detention facilities. 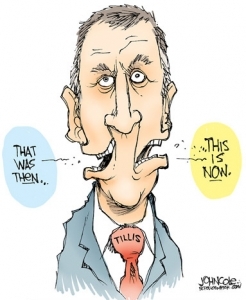 Happily Millen is back at it — this time with a scathing critique of Tillis’s epic flip-flop last week on the legislation to disapprove of President Trump’s emergency declaration. I must say I was very disappointed in your vote to uphold the president’s state-of-emergency declaration. For several weeks, you had said you would vote against it. Then, at the last minute, you voted in favor of it. This seemed particularly odd because so many of your Republican colleagues – not just the squishy types like Collins and Murkowski – but folks like Rubio and even Wicker of Mississippi – had the guts to stand up to the president. Knowledgeable political observers say you did it because some far-right North Carolina Republicans started threatening you with a primary challenge next year. I’m not so knowledgeable, but I suspect that’s true. I get it that humans are programmed for self-preservation and politicians may have an especially strong version of that genetic trait. But all of this has me wondering what the point of you as our senator is. If you are this easily bullied, what purpose are you serving? Is the next year and a half just going to be one vote after another where you look to your right and look to your left, figure out where the worst beating is going to come from, and then vote and climb back in your hole? Believe me when I say that I was no fan of our late Senator Helms. I didn’t vote for him once; I never even considered it. I disagreed with the vast majority of his positions. Yet it never occurred to me that he decided how to vote by putting his finger up in the air like some confused golfer. Whatever you want to say about Senator Helms, he had the courage of his convictions. It’s not clear to me that you have any convictions. As for courage, today’s vote shows you are entirely lacking in it. Surely there must be a better way for you to spend your days than being such a non-entity as a senator. I recognize that it’s a prestigious job, but at some level the country-club life must be beckoning you. For us constituents, it’s becoming embarrassing. From my perspective, North Carolina would be better served by someone – Republican or Democrat – who actually seemed to have some affinity for the job and an ability to do it. p.s. It’s also disappointing that the only way to communicate with is by typing into this white box on your website so that we can get an AutoReply from you saying that our views are very important to you. I’ve dealt with cable companies that managed to generate more warm interactions. Thank you for this wonderful letter calling the NC coward out. I am in total agreement we need a senator that’s not a puppet for a mad man in our WH. I read the op-Ed and rejoiced. I thought that I had a Senator with backbone. It is time Both Senator Tillis and Burris remember they represent NC citizens irregardless of party affiliation. Strong Arm Pressure applied by the Trump Machinery to back his wishes no matter is they go against the state citizens should not be yielded to. We pay his salary and expect satisfactory job performance on our behalf.